Need a customized tin, with your logo? Goody's Popcorn has a wide variety of corporate gifts for all of your marketing needs, we have everything from the simple bag with ribbons, to wrapped gift packages. Let Goody's provide you with your next gift giving idea! Let Goody's cater your next big corporate meeting or orgazinzations party, with one of our Popcorn Bars, we have the dishes and the staff to take all of the worry out of your next event. 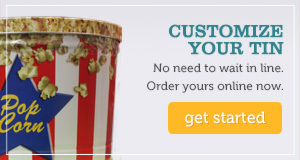 With over 85 flavors of gourmet, made from scratch popcorn we fit all of your snacking and party needs!!!! Call us at (Lubbock) 806-792-2676 / (Amarillo) 806-358-2676 or fill out our quick contact form today to find out more about our Corporate Gifts!